The Trust for Tourism Promotion of the Riviera Maya (FPTRM) directed by Dario Ocampo Fleet was in Vegas last week for a tourism promotional opportunity. 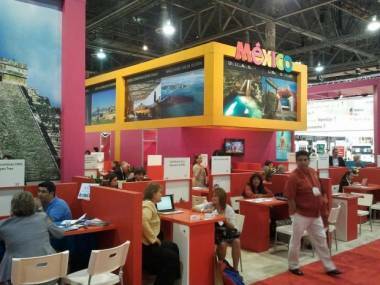 The FPTRM presented itself to the Mexican Caribbean for Meeting Planners (Event Organizers). The event exceeded their expectations, because 40 appointments were set as well as 12 more meetings with professionals dedicated to the organization of conventions. The assistance of the Riviera Maya at IMEX America Las Vegas had particularly positive results because of the more than 50 preset appointments, 90 percent had confirmed groups to hold events in this tourist destination, and required additional information from hotels, attractions and amenities or local logistics companies (DMC's). The Riviera Maya participated in the Pavilion of Tourism Board of Mexico (CPTM), which was also the Convention and Visitors Bureaux de León Guanajuato, Monterrey, Puerto Vallarta, Queretaro and Jalisco, as well as the Ministry of Tourism of Yucatan , the Cancun CVB and local businesses as xperiences Xcaret, Grand Velas Hotel, Palace Resorts, Banyan Tree, Riu Resorts, Tropical Incentives DMC's, IVI, Olympus, and Jaguar, among others.